While I love all different types of music, my heart still skips a beat when I hear popular songs from the early and mid 1980s. I think it is partially because I was in my formative years during that period, heading into high school, and music spoke to me in a different way than it does today. For that reason, when I hear certain songs, they also bring up memories of people and places and times that I thought I had forgotten! One of my favourite bands from that period in my life was Spandau Ballet. Every time I hear the song “True” , it just makes me smile! 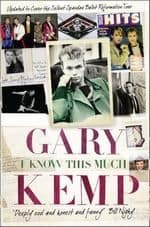 For that reason, I was really looking forward to reading the memoir, I Know This Much by Gary Kemp. I found this book fascinating for a few reasons. This book was rich in British social history of the 1960s, 1970s and 1980s. I am fascinated with cultural history and I learned a tremendous amount about the social movements within Gary Kemp’s world in London during those decades. I found myself reading this book slowly (which isn’t common for me) because it was so rich in description that I didn’t want to miss a single thing! I loved the fact that Gary is a natural story-teller and that all of his little digressions into stories relating to his childhood made this book even more interesting! When the story moves into how Spandau Ballet came into existence, and their rise to fame in Britain and North America, I was even more intrigued. I loved how Kemp talks about all of the other bands that rose to fame around the same time and how much of a small world Britain was musically during that time period (the anecdotes about Boy George are particularly funny). I loved how Kemp tells the story behind some of the band’s greatest hits (including “True”) but also talks about the difficult times that took place that ultimately lead to the band’s demise. Kemp balances the story of his life (including his childhood, his relationship with his brother Martin and the death of his parents) with the story of the band. I could feel Kemp’s pain, through his writing, when he wrote about his parent’s death and I could feel his joy when he wrote about how the band found their way back together. Kemp is a powerful writer and this book made me smile at some points and brought tears to my eyes at others. I appreciated Kemp’s honest and revealing look at his life and his music. I think this is an amazing book for anyone interested in the cultural history of Britain from the 1960s to the 1980s or anyone who loved Spandau Ballet. You won’t be disappointed!